Super late March roundup ahoy! Been VERY busy with life/work, but with the Easter holiday, got a bit of time to edit/upload the shows from the end of the month. Alongside his rakugo master Tsukitei Happo and Jinnai Tomonori he hosts this show where they interview Yoshimoto comedians about their careers. 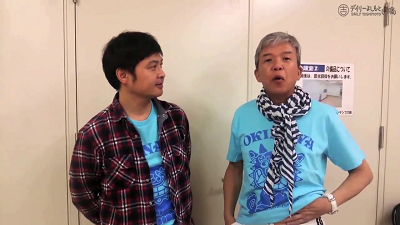 Female comedy duo Porcupine Fish ( ハリセンボン). Female comedy duo High Heels ( ハイヒール ). Yoshimoto Biographies SP series featuring a wide variety of comedians from young to veteran duos and a highly experienced rakugo. Includes a funny scene where Housei gets easily taken down with a Jiu-Jitsu martial arts move. Guest: Chiyotaikai Ryūji (Japanese sumo wrestler). 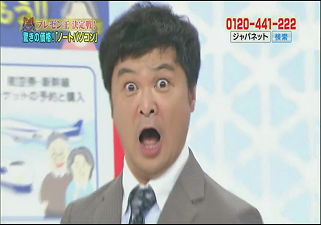 A casual Kansai-based variety talk show that Hosei appears on every Monday. A contest to see who can be the most entertaining whilst trying to sell a product. A Kansai-based show highlighting various products that Hosei hosts every Monday. Sometimes there's also repeats of earlier broadcasts. So is NIJI working with you fine enough? 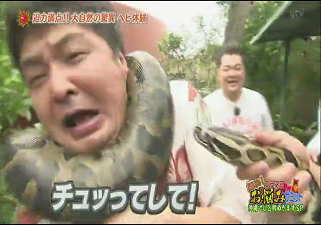 Sometimes if I'm lucky the Kansai channels work but it's not at all reliable so I end up missing programs. The other day I tried to record something and it just kept stopping at 0% loading every time I tried. Other times the stream will glitch out or lose sound. Some of my most recent recordings have required re-encoding due to how corrupted they are from the stream breaking up so much. This ep is a parody of Battle Royale. 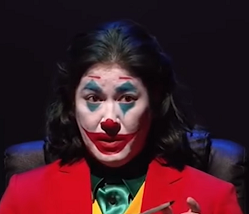 It's a parody of 'Who wants to be a millionaire', and Okamura(as 'Oka Monta') is parodying Mino Monta. The "contestants" are caught off-guard, and then brought into the studio.Three questions to expose their private lives are asked, but in Hosei's case, it feels more like they are making fun of him. I really am on a mechaike kick right now..
Found another episode with Yamasaki Hosei. The Fool Battle Club. The contestants have to make the each of the 3 guests laugh within 5 minutes. Thanks solari for these great contributions! I appreciate it. Super busy with life/work right now so unable to do a roundup yet etc. but glad this topic is being kept active with new content Fool Battle sounds fun, gonna check that out! Oh wow, I didn't know this existed, looks like some kind of direct-to-video thing released in 2012. Apparently about a group of kids who run away from home for different reasons and wind up at a remote cabin owned by an elderly man who takes them in. No idea what Housei's role is, looks like he's tracking his missing family and something leads him to the man at the cabin. Then he and the kids get caught up in some danger, but thats just my wild guess. There's no Download Link for the movie, maybe it's ''brand new'' nobody can upload it on the Internet yet. i thought its 2012 released? Apparently it was released on July 8, 2008. And it's impossible to find it. You can give it a go by putting ''あの日、ぼくらの大脱走 TWILIGHT FILE X'' in Google and hope it's online. But maybe "Production" literally means thats when they were filming it. I wonder if it isn't out yet...? End of 2013 it seems there was some news about it, mostly about one of the kid actors, but it also mentions Housei starring in it to "face off against the kidnappers". "Theatrical greeting for Mirai Actors production movie "TWILIGHT FILE" series 9th and 10th edition will be held on 6/14 (Sat) - 6/20 (Friday)." Perhaps after it's released a DVD will appear on Amazon Japan which you can import from. It has almost the same kanjis as the movie title!